Queens, NY The New York City School Construction Authority (SCA), Urbahn Architects, and general contractor MPCC Corp. have reached the construction milestone of “topping out” – or completing the structural steel frame – for the Public School 144 addition. 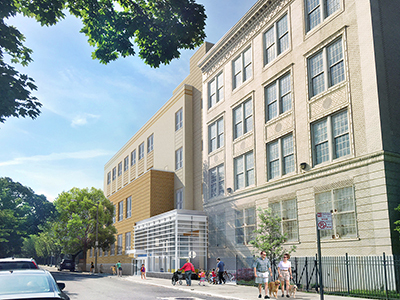 Located at 93-02 69th Ave. in the Forest Hills section, the addition will accommodate the growing enrollment in the elementary school, also known as the Colonel Jeromus Remsen School, which currently serves 894 students in grades Pre-K to 5. LERA Leslie E. Robertson Associates; mechanical, electrical, and plumbing (MEP) engineer Loring Consulting Engineers; civil engineer YU & Associates Engineers; landscape architect Edgewater Design; lighting consultant Lumen Architecture; acoustic, A/V, IT, and security consultant Cerami & Associates; and food service consultant Schiavone Designs. Urbahn’s architectural design team includes Lead Partner and Principal Donald E. Henry, AIA, LEED AP; Designer and Principal Martin D. Stein, AIA; Project Manager Martin Kropf; and Project Architect Oni Lloyd. “In addition to accommodating the school’s functional and programmatic needs, Urbahn’s architectural team has focused on insuring that the design of the new building respects both the look of the existing school and the scale of the surrounding single-family home residential neighborhood. In order to visually reduce the perceived scale of the addition, we incorporated a two-story brick portion into the June St. façade. It features a contrasting brick color to draw attention to the smaller scale of the lower portion,” said Urbahn Designer and Principal, Martin D. Stein, AIA. The new addition will house 26 classrooms, an outdoor early childhood playground, a cafeteria and kitchen, an administrative office suite, and a medical suite. In addition, the scope of work includes improvements to the existing school building, including the replacement of doorknobs with ADA-compliant door latches; ADA-related relocations and renovations of bathrooms; upgrades to an exercise room, a guidance suite, auditorium, and four classrooms; and the installation of an inclined chair lift to provide accessibility to the lower area of the existing building’s third floor. The school will also receive new ADA-compliant water fountains, all of which will feature bottle-filling stations. The project will create a new ADA-compliant entrance and lobby that will serve the entire expanded school that will be located on Juno Street, as well as adding two elevators. The entrance lobby will have a large glass-and-metal storefront and broad open stairs to the first floor level and down to the student dining room/cafeteria level. The cellar of the new addition will house both a dining room and a kitchen. An all-new administrative office suite will be located on the first floor. The first and second floors will house Pre-Kindergarten and Kindergarten classes. 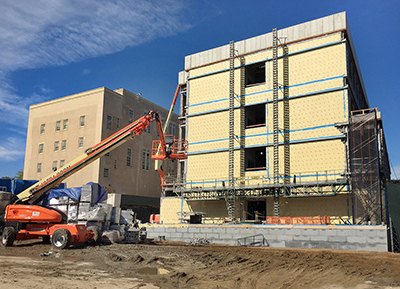 The third and fourth floors will provide classrooms for second and fourth graders.